The debate about proposals to increase the minimum wage in San Diego continues today. Yesterday the Chamber of Commerce and San Diego County Taxpayers Association held a press conference featuring the release of a ‘study’ predicting doom, gloom and increased poverty unless they were allowed to pay lower wages. The study, as I predicted yesterday, was a joke, starting with its assumptions (failing to acknowledge San Diego’s higher cost of living) to its solutions (a state earned income credit). A small group –the Coalition for Labor & Community Solidarity– protesting the conference was ignored by local media outlets, with the exception of NBC7. This morning the pro-increase Raise Up San Diego held their own media event, featuring a handful of small business owners explaining why they support San Diego City Council President Todd Gloria’s proposal for an initiative on earned sick days and a minimum wage increase throughout the city. While I appreciate the back and forth between people who sign paychecks (having owned and operated a restaurant or two), I remain concerned about what’s being left out of this conversation. It’s all well and good to hear about the challenges facing the owner of a hipster restaurant (that I patronize) in North Park; it would have “fair” to interview his dishwashers about their challenges. Except that workers today have so few protections most wouldn’t dare talk to the media. That’s a part of this ‘debate’ we haven’t heard about. And this prattle about tipped employees working its way through news stories is just jaw droppingly inane. The earnings of a small percentage of service industry employees who are lucky enough to work in high-end establishments are held up as a reason to screw over waitresses working at moderately priced establishments. Treating poverty wages and misery as a “pro” or “con” issue only serves to dehumanize and demean the reality of more than a third of our local workforce. People earning poverty wages (which are often just above the legal minimum) often need to government assistance to get by. We pay taxes for those programs. How about some concern about the fact that low pay rates require what in effect are government subsidies? The “human resources director for Phil’s BBQ”, a company known for its support to right-wingers like Carl DeMaio (who’d shred what little we have left of a safety net programs in a heart beat), said her firm is “exploring the possibility of becoming a non-tip restaurant and imposing a mandatory service charge on all sales” – and sharing some [of] the proceeds with employees. Under the Federal Fair Labor Standards Act (FLSA), a mandatory service charge is not a “tip” because customers are not given the discretion to determine whether to pay it or how much to provide to the server. Therefore a restaurant owner may opt to retain any or all of the service charge, so long as the employee earns at least the minimum wage. One other thing– there are petitions floating around in front of retail centers that purport to be in support of an initiative raising the minimum wage. They are a sham. Hotel and restaurant employees, along with 93% of all other minimum wage earners, are exempted. What’s really sick about this deal is that it’s being funded by… the hospitality industry. Another thing I don’t see the “caring” people at the Chamber of Commerce talking about is wage theft. A new poll finds that 89 percent of fast food workers nationwide say they experience wage theft. That means that nine out of every ten fast food workers doesn’t get the pay they earned, according Hart Research Associates’ findings. The most common violation, workers report, is off-the-clock work. About a quarter of those surveyed had worked over 40 hours in a week on some occasions, and half of that group said they didn’t get overtime pay for those hours. (1) Economic growth cures poverty. “The federal government,” Paul Ryan, the House Budget Committee chairman, wrote recently in The Wall Street Journal, “needs to remember that the best anti-poverty program is economic growth.” Baloney. Since the late 1970s, the economy has grown 147 percent per capita but nothing has trickled down. The poverty rate remains around 15 percent. That’s higher than it was in the early 1970s. More baloney. A higher percentage of the poor now work than has been the case in thirty years, and a smaller share of their income now comes from government programs. But they’re still poor. The only thing that’s different is the number of “working poor” – a term that should be an oxymoron – has exploded. Still more baloney. The poor aren’t poor because they lack ambition; what they lack is opportunity. America is the only rich nation that spends less on educating kids in poor communities than in middle-class and wealthy ones. Don’t buy the right-wing lies about poverty. Know the truth, and share it. The Vote on Barrio Logan’s Plan… And How About Ocean Beach? KPBS/inewsource has published an excellent interactive map showing how communities in San Diego voted on Propositions B&C, which would have affirmed the Barrio Logan Community Plan. According to preliminary results (there are still 94,000 mail and provisional ballots outstanding), Propositions B and C failed by margins of 58 percent to 42 percent and 61 percent to 40 percent, respectively. They passed overwhelmingly, however, in the precincts that cover Barrio Logan, a low-income, mostly Latino neighborhood on San Diego Bay that has long been the center of the ship-building industry. The vote on Propositions B and C marked the first time a neighborhood’s community plan was put before a citywide vote. One the neighborhoods outside the core areas of the city that did support the plan was Ocean Beach. They’re having their own challenges in updating their community plan. Frank Gormlie at the OB Rag has given this issue extensive coverage. At last night’s meeting of the Ocean Beach Planning Board, the Board approved a Petition to be circulated throughout OB that supports the OB Community Plan- as a show-down with the San Diego Planning Commission approaches. One week ago, OB’s Community Plan Update was before the Commission for its review before it headed to the full City Council later this month. Even though they voted to approve the Plan, the Commissioners did so after they made two modifications – one of which took the teeth out of the OB Plan, so OB planners feel. Today’s UT-San Diego says, sort of, that the $1 million reportedly missing from an police department fund was the result of paperwork errors. And there was another $1.8 million also missing from drug seizure funds. That, too, was just more paperwork boo-boos. But something is rotten here. One week after being asked about the $1 million missing from its federal forms, a police spokesman acknowledged the discrepancy and said the matter was referred to the city comptroller. Independent City Auditor Eduardo Luna, whose position was created by voters in 2008 as a check against the “strong mayor” form of government, has questioned why the matter was not referred to his office. Mayor Kevin Faulconer, whose office oversees the Police Department and the comptroller, issued a statement on May 27 saying Luna is also welcome to review the matter. On May 29, Faulconer’s comptroller issued his two-page preliminary report, addressed to Chief Financial Officer Mary Lewis. Lewis forwarded the review to members of the City Council and Independent Budget Analyst Andrea Tevlin the next day. Luna was not included in the correspondence. Orcas and Theme Parks… And Sharks… Oh, my! Voice of San Diego hosted a conversation last evening at the Museum of Contemporary Art in La Jolla about SeaWorld. VOSD’s Lisa Halverstadt, who has authored numerous articles on the subject, and editor Scott Lewis moderated an event that was especially notable because SeaWorld agreed to participate. Panelists included Susan Gray Davis, a former UC San Diego professor who wrote a book about the park’s business model, veterinarian Todd Robeck, who leads breeding and reproduction programs at SeaWorld and Busch Gardens, Kristi Burtis, a senior animal trainer who has worked at SeaWorld San Diego for more than 26 years and Naomi Rose, a marine mammal scientist with the Washington, D.C.-based Animal Welfare Institute. North American theme parks last year enjoyed a marked growth in attendance, in some cases surpassing pre-recession numbers. But at SeaWorld, visitation instead slumped. A report released this week that tracks visitation at amusement parks worldwide revealed a 3 percent decline for SeaWorld San Diego — dropping its attendance to 4.3 million — and an even larger 5 percent slump for the Orlando, Fla., park. They were two of just five parks out of the top 20 in North America that saw declines in visitors, according to the nonprofit Themed Entertainment Association and Aecom, which each year releases a report that tracks and analyzes attendance figures not normally divulged by the parks. And if all that just isn’t exciting for you, SyFy has released the Trailer for “Sharknado Two: The Second One.” The high-camp spoof on horror movies features guest appearances from Matt Lauer, al Roker, Billy Ray Cyrus and Kelly Osbourne. On This Day: 1944 – The D-Day invasion of Europe took place on the beaches of Normandy, France. 400,000 Allied American, British and Canadian troops were involved. 1968 – Senator Robert F. Kennedy died at 1:44am in Los Angeles after being shot by Sirhan Sirhan. Kennedy was was shot the evening before while campaigning for the Democratic presidential nomination. 1972 – David Bowie’s “Ziggy Stardust and the Spiders From Mars” was released. The Chamber “Study” is a joke. No hard factual data. No qualified economist author. A Right-wing piece of ill-informed propaganda. This “news paper” treats it as fact, and never examines the study or questions its methodology or conclusions. All anecdotal data drawn from observations of suburban, white, upper-middle class parents . An increase in the Minimum Wage will not improve lives and reduce poverty “… because most minimum wage workers live in households with high incomes, such as teens in wealthy families.” This assertion is made with NO factual foundation presented. NONE. REALLY ? Tell that to the hotel housekeepers, grounds keepers, bussers and servers throughout San Diego. Talk to McDonald’s and Jack-in-the-Box employees south of the I8. “Reporting” is a lost art at Manchester’s publication. No wonder the circulation is diving. Who reads this ? That interactive map showing how the city voted on Props B&C very quickly reveals that Barrio Logan was joined in its disappointment by North Park. Ocean Beach, San Ysidro and Otay areas also sided with Barrio Logan, while most areas of Imperial Beach went with the side that thought too little about local control over planning or bought the baloney sliced by big money — that the Navy would leave if we protected ourselves from the shipyard toxins. The maps shows that San Diego north of I-8 — with only two meaningful exceptions — decided the vote. The two exceptions were slivers of Mission Valley. 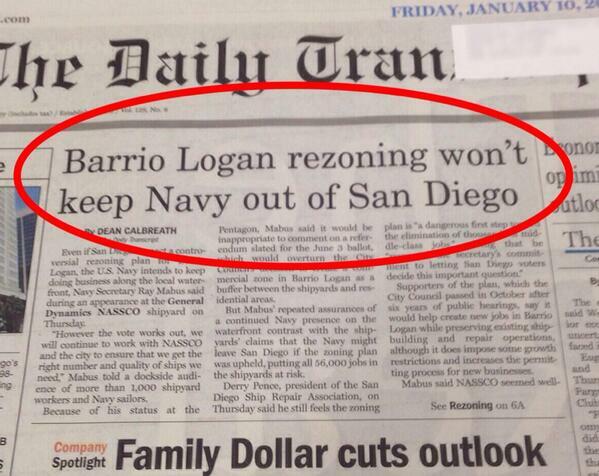 San Diego is like a map of the U.S., divided in half by class, ethnicity and selfish interests. Here’s a link to my full OpEd piece on Barrio Logan and the election results. You’re describing “white flight” (a term no longer in use in this “post-racial” era) and to that I want to add these cultural markers of the Northerner. An SUV driver who speeds up to prevent the on-ramp car from gaining the freeway. (They commute a lot and their time is valuable). The Northerner is suspicious of SDSU, but feels USD is a good bet for their kid, who can’t get in UCSD. They know they’re not racists because a great grandparent was half Cherokee (Apache?). They fear Scott Lewis might one day vote like a Democrat. They fear chopped and lowered old Mercs. They fear smoking dope because they went paranoid the last few times. They fear they don’t have enough fire insurance. They fear too much, and hatred is the result. Baloney to that Chamber “Study” which says most minimum wage workers are teens living with their high income families! Have you TRIED to find a job for a teen in San Diego’s economy? The places they used to work in the 1980’s and 90’s now hire adults mostly from the Hispanic community. They need a job too, but I repeat, it is next to impossible to find a minimum wage job for a teenager. let me know if you have any openings, I have grandsons looking for summer work experience. Thank you SDFP for reminding us: the corporate welfare state is alive and well, and those who benefit from it are filling the campaign coffers of those who perpetuate the cycle. Need cheap workers? Draft a petition. Don’t want to pay for healthcare? Cut hours under the minimum needed for the Affordable Care Act. The art did not go over big with city boosters, but rang true for many others, and is still accurate today. Most have heard of the “industrial military,” complex but not the Congressional aspect, which the San Diego delegation exemplifies to maximum benefit for boosting their re-election coffers. And be assured, shipyards and related industries in Logan play the same game, with the same players, including those at the local level. Again, thanks to SDFP for bringing this to light. Read a great quote from Barbara Ehrenreich about the minimum wage issue. She has little sympathy for businesses who say they can’t afford to pay more than they now do. 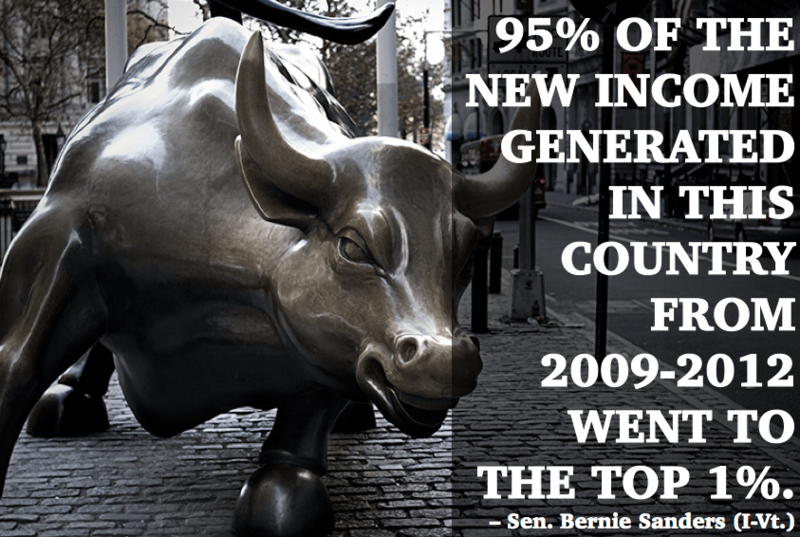 It’s really class warfare, but a lot of people haven’t woken up to that fact. The plan is for a small group of super rich and talented elitists with everyone else working menial service jobs providing them with services. A new aristocracy and a new serfdom. The Chamber of Commerce and other right wing groups are out to promote this reality. And they believe that the rich and powerful deserve all measure of perquisites and nothing is to good for them at the expense of everyone else.